In 2009, at the age of 15, Joy Womack became the first American ever to be accepted into a Russian ballet company, training with the Bolshoi Ballet Academy. 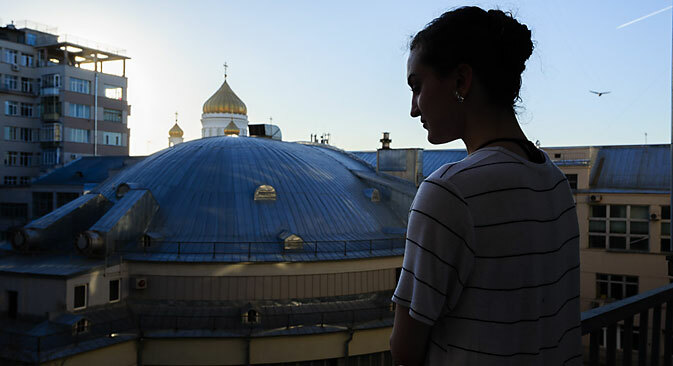 After the high-profile internal conflict at the Bolshoi Theater in 2013, she decided to remain in Russia and a year later became a principal dancer in the Kremlin Ballet Theater. RBTH: Why Russia? Why the Bolshoi Ballet Academy and not, for example the School of American Ballet? Joy Womack: For me the reason why I chose Russia was the fact, that I knew from my previous studies at the Kirov Academy in Washington D.C., that the Russian school system was the best, and that it produced the highest quality of dancers. So for me, without question, the opportunity to come to Russia meant that I would be preparing myself to be on a higher level from those trained in the States. RBTH: How do American and Russian attitudes to ballet differ? J. W.: I think that the difference between American and Russian attitudes towards ballet has to do with aesthetics. I think that Russians have an extreme sense of tradition and passion and are ready to make sacrifices for their art form. Ballet should really be about the story, about your emotions, and about creating something real on stage. The American attitude tends to be more about the music, more sensational, the more tricks you can perform on stage. It doesn’t mean that either one is better or worse. But I just felt that the Russian idea or school of ballet is more historically correct and is rich in tradition and in that way it seems closer to the real thing. The person who introduced ballet to America is George Balanchine, and he is of Georgian-Russian descent. So American ballet is really like a baby of Russian ballet. So there is still a lot to learn. And sometimes in American schools things get lost in translation. So I feel like I’m closer to the original thing here in Russia. RBTH: What role does Russian ballet play in the ballet world? J. W.: I think that Russian ballet is the leader of the ballet world today and they have the most authority because they have the purest school, and they produce the strongest dancers, which is an unarguable fact. People argue against it, but if you look at the rosters of any international ballet company, you’ll see Russian dancers there. I think that it will be interesting to see the new generation that is coming up, because there have been more foreign dancers being trained through Russian schools. And it will be interesting to see if they rise to positions of power in companies. RBTH: What was the hardest thing to get used to in Russia? J. W.: When I first came I didn’t speak the language. And Russia is one of those countries where you need to learn the language. It’s the key to the people. It’s your pass to learning. I don’t think you’ll have the same experience in Russia without that. RBTH: What Russian cities you have visited? J. W.: So many… My favorite Russian city, I have to say, was Arkhangelsk because of the juxtaposition of snow and the beach. I had never seen that. And so for someone who is raised on a beach, after so many years never seeing a Russian beach, and then going to Arkhangelsk and dancing there. That was amazing. RBTH: Your negative experiences in the Bolshoi Ballet Company are well documented. How have these experiences affected you? J. W.: I think that during that period of time I was very naïve and very young and I didn’t know what was going on around me and I didn’t even know how to be in a company. So I think that there are a lot of things that have been taken out of context and a lot of things that were said that weren’t true. And a lot of things were printed that were typical sensationalized nonsense. And I think that I’m very happy that I’m still in Russia today and I’ve learned a great deal, and I’m extremely grateful to the Bolshoi for the experience. I’m grateful to have been able to dance there and I’m grateful for where I am in my career today. But what they reported in the news makes it seem the opposite way. You can either decide to give up and go home or you can stay in the ring and fight. And just because something bad happened to me there didn’t mean I wanted to give up and didn’t mean that I was turning my back on Russian ballet. I’m so thankful to the Kremlin that they accepted me even after this story broke. That says a lot about the character of the Russian people. Even after these terrible, terrible things that were being written and posts from people that really didn’t like me, all of a sudden there was a company that said: “We are going to take a risk on you.” And that means a lot. RBTH: What makes you still believe in Russia, still want to live here? J. W.: What makes me still want to live here and what makes me still want to believe in Russia is the people. The extreme strength that is inside each person to survive and to thrive. And I think that is so special, when you meet a whole entire nation that doesn’t let go if things get difficult, you know, what they say in Russian: “Opuskat ruki” – we don’t let go of our arms, we don’t give up. That is inspiring to me and I want to be part of the team. RBTH: What is your favorite role to dance? J. W.: I think my favorite role that I’ve danced so far is the bedroom Pas De Deux from Romeo and Juliet. And I love dancing Pochito on the Bolshoi stage. And then I just recently danced Myrtha in Giselle and I really liked that. And of the roles that I have danced I really love the Odette and Odile in Swan Lake. But of course I covet Juliet and I want to dance Giselle and I want to dance all the big ballets. RBTH: Who would you like to dance with most? J. W.: That is so hard to answer! I think it’s so incredible to have an opportunity to build a partnership with someone. And I’ve had the great privilege to dance with the principal dancer of our company Mikhail Martynyuk, who taught me a lot about this process. But I haven’t found that partner yet. I think I’d like to dance with [the Mariinsky Theater’s British dancer] Xander Parish, because I think that we are really similar people and I look up to him a lot. I think we would have an interesting duet just because of our backgrounds. I think that would be really fun to explore.